Do you have fire ant pest control on the mind? Fire ants aren’t anyone’s favorite guests to the outdoor party, and for good reason—they are not very neighborly. These territorial ants can take over acres of lawn and garden space, populating your yard with thousands or millions of ants at a time and sending out new colonies every year. As soon as you notice a problem, it’s time to get on top of it. If you have noticed fire ants in your area and are curious about fire ant pest control, we’ve got the skinny here. Why Do You Need Fire Ant Pest Control? Firstly, fire ants sting. Their stings are very painful, and can cause extreme nausea, irritation at the site of the sting, hives, facial swelling, and anaphylaxis, especially in children. The last condition can hinder breathing and prove life-threatening; so, it’s crucial you do everything you can to monitor and remove fire ant colonies from your yard. Secondly, fire ant pest control is a good idea because ant mounds may do damage to your yard and lawn. Although the mounds are not as tall or central as those that some other ant species build, they can still ruin the look of your yard with their 6-inch upswellings. People who come near the mounds, even if they don’t notice them, are at a high risk for getting stung by aggressive ants. • The drench method: This involves pouring liquid insecticide into the center of each mound, using enough to flood the whole mound so that you kill the queen. Don’t overdo it; insecticide is bad for the environment. Note that fire ant mounds don’t have a central hole, so you’ll have to make one. • The boiling water method: Pour boiling water into the center of the mound. Usually, 2-3 gallons is sufficient. • The trap method: Use fire ant traps around the mounds at their bases, since this is where the tunnels enter the mound. You’ll need to use a few per mound to cover the area where the ants are located. Of course, in an ideal situation, you wouldn’t have fire ant colonies, and therefore wouldn’t need to control them. 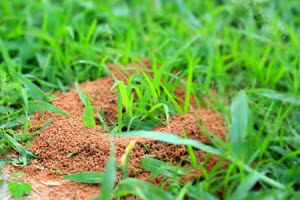 If you want to reduce the amount of fire ant pest control necessary for your lawn, the best idea is to approach fire ant problems with a year-round plan of action. A couple of things you can do on your own is regularly clean out your hot water heater closet, since fire ants often nest there, and keep your foundations closed off when possible. Need a partner in fire ant pest control? Visit our team of pest control experts at Think Green online or call (678) 648-2556. We can provide fire ant pest control to get your lawn ready for guests. We can also provide a lawn maintenance plan to make your lawn as healthy and safe as possible year-round.